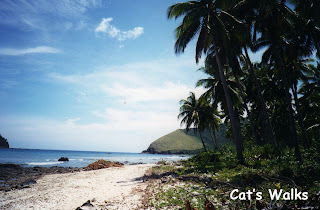 Baler is the capital of Aurora Province on the east of Central Luzon. Bordered by the Pacific Ocean on the east, and the Sierra Madre Mountain Range on the west, it's remoteness makes it wild and unspoiled. It was a big adventure to get there. From Manila we took a Baliwag Transit Bus to Cabanatuan then from Cabanatuan to Baler we took a Sierra Madre Transit Bus. The road passing through the dense green forest of the Sierra Madre was spectacular! It was a real treat for a nature lover like me. The bus stopped halfway to Baler at this small eatery which sold cheap and delicious pork barbecue. In Baler we stayed in Bay's Inn (around P600 a night, with a good restaurant) which is directly on the long, wide black sand of Sabang Beach (sorry, no picture). Sabang Beach is famous for large waves that comes between October to February. Since we don't surf, the next day we decided to walk around. I don't remember exactly which direction we went but we ended up near the Añiao Islets (I just found out recently that together with Cemento Beach, Digisit Beach, Dimadimalangat Islet and the Lukso-Lukso Islets are great spots for snorkelling). We went there for field work, and yes, the province is really one of the best! Yeah, and it is quite raw and undiscovered! im from baler. I just want to say thank you very much for loving my town and the province. did you go to the Balete tree at Maria Aurora? or the Mother Falls in Ditumabo? if not, i hope you come back and visit those..
We will go back for sure! Baler is really great. Thanks for the info! My girlfriend and I are going to Baler this holy week just wanted to find out how are the road conditions going to Baler can a Mazda 3 make it or do you really need a 4x4? 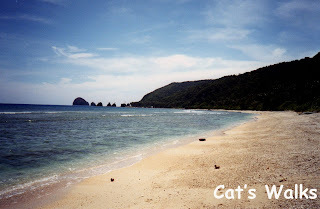 Your article about Baler is very good and ang enticing.. makes me crave to go to Baler. Thanks!